Rajma Chawal is the most famous North Indian delicacy made with Rajma (Red kidney beans) and rice and of course in different ways. 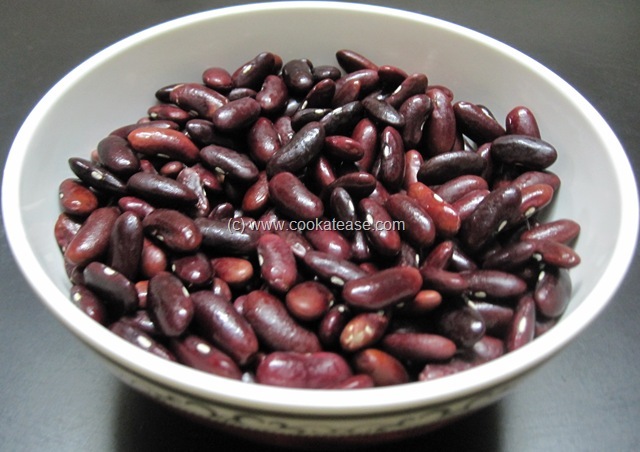 Rajma is rich in iron and protein and it is a great source of carbohydrates when it is combined with rice. Rice is the main component of cooking in Southern part of India. Normally, we try to prepare varieties in rice. Rajma is not very familiar in South India. I tried to prepare this dish in South Indian style and it came out very delicious and tasty. It took very little time to prepare. I tried to made it simple so that every body specially, beginners, can try this. If beginners try this once, they will love to prepare this dish again. The best part of this dish is we can serve it for break fast, lunch and dinner as well. I prepare this for lunch box. Let’s see the preparation of Rajma Rice. Wash Rajma beans with plane water. Soak them in 250 ml water, so that they will expand in size very well. Soak them overnight for better results. If you are using canned beans, you can use them directly. But it is good for health to use dried Rajma than canned one. Drain water from soaked rajma beans. Pour soaked Rajma beans directly in to a pressure cooker (capacity of 2 or 3 litres). Add 1/2 cup of water and 1/4 tea spoon salt to it. I am adding little bit of salt while cooking rajma so that each and every beans will absorb salt. You will experience the taste of rajma in every bite. Close the pressure cooker with lid. Keep the cooker on low flame. Allow it to whistle thrice and remove the cooker from heat. Cooking on low or medium flame, helps in enhancing the flavor of the beans and beans will be cooked completely and softly. Allow the cooker to cool down. It may take 10 minutes to cool down. Wash rice with plane water and soak it in 2 1/2 cup of water for 10 minutes. Soaking the rice before cooking helps to soften the rice after cooking. If you are using basumati rice, you can add 2 cups of water for 1 cup rice. If you are using sona masoori or any other type of rice, you can add 2 ½ cups of water for 1 cup rice. Pour washed rice along with water into a pressure cooker or electric rice cooker. If you are using pressure cooker, place the cooker on low flame. It may take hardly 10 minutes to whistle. Allow it to whistle twice. Remove the cooker from heat and leave it to cool down. Pour the cooked rice in a wide bottomed bowl, do not tamper it leave it as it is, if you tamper it, it will be mushy. Cut tomatoes into small pieces. Pour them in to small jar of mixer. Grind it to a fine paste without adding water. Now your tomato puree is ready. Take out to a small bowl. Tomato puree is readily available in the market. If you can’t prepare it in home, you can purchase it from the market. But it is better to prepare it in home. It is very easy to prepare in home. The home made puree, will enhance the taste of the dish and it is healthy as well. Peel off the skin of garlic cloves and ginger. Make the past of garlic and ginger together, without adding water. Take out the paste to a small bowl. Chop the onions into small pieces. Chop the coriander leaves. Keep them aside separately. Heat a frying pan (Kadhai), pour oil in it. Add mustard seeds, wait until they split completely. Add cumin seeds and haldi powder to it. Add ginger garlic paste immediately. Cook it for 10-20 seconds by stirring it with the help of a spoon. Add chopped onions and roast them for 1 – 2 minutes. Add tomato puree to it. Sprinkle a pinch of salt and suger over it. Mix all the ingredients with the help of a ladle. Close the pan with lid and allow it cook for 3-4 minutes. While cooking the vegetables, if you sprinkle salt and suger over it. It will help to retain the colour and flavor of the vegetables. Also it will be cooked evenly and softly. Open the lid of pressure cooker. Pour boiled beans to the gravy. Add remaining salt, red chilly powder, lemon juice and coriander powder (Dhaniya powder) to it and mix it well. Cook it for 5 minutes so that rajma beans should absorb all the flavour and taste of the gravy and gravy should become thick. Cook the gravy until all water content is absorbed and starts leaving oil. Close the pan with lid, remove from the heat and leave it as it is for 10 minutes so that its aroma will be enhanced. Pour the gravy over cooked rice, spread it evenly and leave it for 5 minutes. Mix it well and sprinkle chopped coriander leaves over it. Hot, spicy and delicious Rajma chawal is ready to serve. The taste of Rajma chawal will get enhanced if You serve it with cucumber-onion salad (Raita). I will try this in my electric rice cooker on coming weekend.